Nose: Explosion of wax and yellow fruit on all floors. It feels terribly good this case! A small chemical side not unpleasant (felt Velleda), a hint of sweet spices. Everything is nicely melted, and more complex than it looks. Call me an early 80s Clynelish, or something like that. Water makes it more tangy (bergamot, kumquats), but also brings out a certain greenness. Palate: Greener than expected, it gives off a nice power. The fruit is always present, but less mature, the spices pass on the front of the stage with a lot of white pepper. The wax continues to wrap everything up. It is not a good swimmer, its aromatic power is diluted very quickly. Final: Quite long and intense, it develops a green bitterness with a hint of acidity before the white pepper and the wax close the ball. Conclusion: The nose is a marvel in the style of some Highlands, but the mouth loses some points, more green, a little less fruity. It remains, however, on a very nice malt which is drunk more dry despite some alcoholic strength (between 50 and 55%?). This is a sherry cask Glenkinchie. 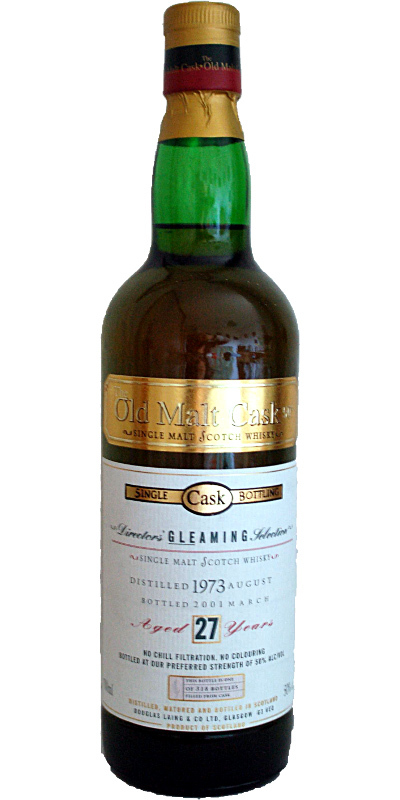 DL used the name `Gleaming` because they expected Diageo to object if they used the distillery name.